I popped down to Todders to cut some wedges for fitting brushes to boot scrapers. I don't like using the band saw when other people are wandering in & out (for safety reasons). Thomas had just arrived. I was on crossing duty at Winchcombe during today's Thomas event. I was greatly impressed with the smoothness of 2807 when buffering up to the coaches to couple up. The new pilot valve works a treat! Paul showed me exactly where the steam leak is by the Y-splitter leading to the condensing coil. It's on the bend in the copper pipe. Bruce went to Todders and did some work on 3850. 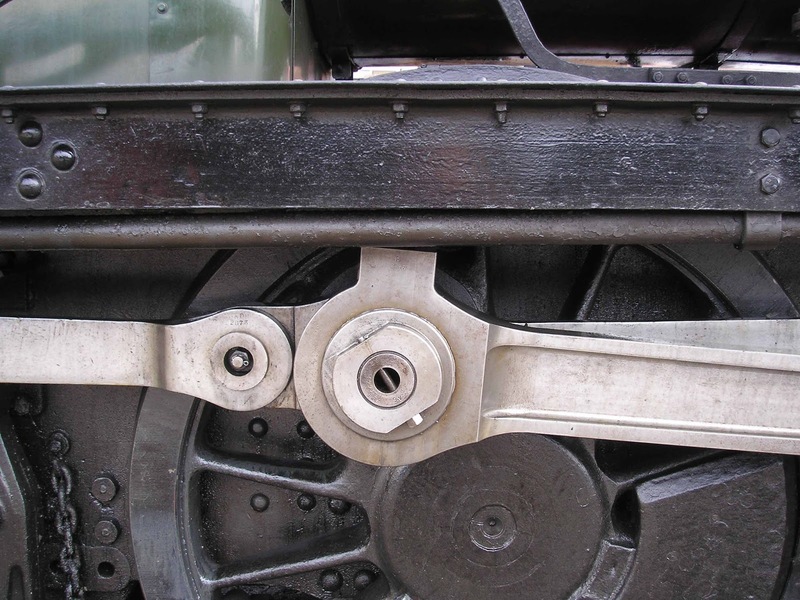 One of the brake tender blocks was loose, and had slipped outwards, resulting in the block wearing and leaving a significant outer edge of metal that was now rubbing on the outside of the wheel. Bruce removed the brake block; cut off the excess metal, and ground the block down to allow the block to work properly (for a while!). Thereafter, Bruce helped in the loco shed, where they were laying metal mesh in preparation for concrete being laid on Monday. Dixie popped in briefly (to collect something) and went on to Winchcombe to work on the siphon. It rained! I couldn't do anything in the garden or go for a bike ride, so I went to Todders instead. No electricity! Off all day … so I went home again. 71 [JW] RH big end losing all oil each trip. Req a whole can each trip. It was plain to see, as 2807 was over the old pit, that there was a significant pool of oil on the concrete apron beneath the con rod big end. Drips clearly being from con rod, not coupling rod. This is a bit of a blow. I had a bit of a bit of a fright as I rolled into Todders car park, seeing a dirty filthy 28xx on the head of the train in Platform 1 … until I saw the smokebox number plate 3850. 2807 had been moved into the yard, and positioned such that the RHS big end was almost top dead centre … and hence impossible to get at the oil pot! Nevertheless, I managed to poke my little finger in, and (sure enough) there was practically no oil in there. This is a puzzle. The pot contains a vertical tube with a flow restrictor within it. When you fill the pot full, oil will flow relatively rapidly down the tube, until the level drops to that of the top of the tube. Thereafter only the motion of the con rod will cause oil to splash around in the pot and some will then drop down the tube. Maybe I should have filled it up today and seen if the level drops when the loco is stationary? Bruce and John T removed the RHS injector steam valve, and then polished its bottom. 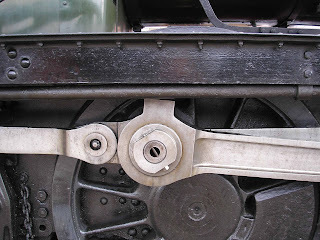 It had been reported that steam passed by the valve, and you can tell from the photo that there was an area at the bottom of the face that was corroded. They fixed this (with Carpo's cutter) and reassembled it all. John T later cleaned a couple of rail chairs and cut bolts off a few more. John G spent the entire day painting rail chairs. I assembled about 10 boot scrapers and re-stocked the F&W (they'd sold two over the Thomas weekend). Out of the kindness of his heart, Bruce helped sweep out the new concrete floor in the loco shed. You may not be aware of the award bestowed upon us all at the GWSR: the Queen's Award for Voluntary Service. There is a video of the highlights of the ceremony, commencing with a few shots of 2807.